In the process “Project Management Plan” formal definition is…. The key things to note about the project management plan is…. It is a single document made up of the other separate plans. It is best to think of the other management plans as chapters in the overall plan. It is not essential for a project to have every single subsidiary plan it depends on the project. The project management plan defines how the project is managed, executed and controlled. It is the go to document for guidance on how to undertake tasks within the project. The project management plan is created in the integration process group as it interacts with all of the other knowledge areas gathering the other project plans. The subsidiary plans are created within their own knowledge areas for example the communications project plan is created communications knowledge area. Firstly the only two plans that are created in “Develop Project Management Plan” process is the change management plan and configuration management plan. The rest of the plans are created in other knowledge areas processes. Purpose: The Change Management Plan documents how changes will be monitored and controlled. Why It Is Important: The change management plan oversees how any change to the “process” should be done. Purpose: The A Configuration Management plan documents how configuration management will be performed. It defines those items that are configurable, those that require formal change control, and the process for controlling changes to such items. Why It Is Important: The configuration management oversees how any change to the “product” should be done. The configuration Management plan would include…. Purpose: The Scope Management Plan describes how the scope documents will be prepared and how the remaining scope processes will be carried out. Why It Is Important: Has a significant impact on project since requirements are primary means of understanding and managing stakeholder expectations. Purpose: The Requirements Management Plan defines what activities the team will perform in order to gather and manage the project requirements. Why It Is Important: It defines how the requirements will be managed but not the requirements themselves. It covers…. How requirements will be documented. Purpose: The Schedule Management Plan defines how the other process within time knowledge area will be carried out. It describes how to deal with changes to the schedule. Why It Is Important: By properly defining the processes up front, it will create a plan against which results can be compared and controlled. Purpose: The Cost Management Plan is created so you know how to create a budget and manage it. Why It Is Important: Will have a plan in case you run out of money. It also describes the units, precision, accuracy and thresholds and performance will be measured. Purpose: The Quality Management Plan is where the team identifies what quality specifications are for this project and how they will be met. Why It Is Important: Deals with problems when deliverables doesn’t match customers standards. Purpose: The Process Improvement Management Plan is created to tell you how quality activities/processes will be streamlined and improved. Why It Is Important: Help improve project management processes so current and future project can be run smoother. Purpose: The Human Resources Management Plan is created to deal with changes in staff and help identify issues with staff. Why It Is Important: Consists of 3 components…. Purpose: The Staffing Management Plan describes when and how human resource requirements will be met. Staffing Management Plan can be updated because of promotions, retirements, illness, performance issues and changing workloads. Why It Is Important: Details how project will be staffed it will include…. Timetable – Resource histogram is prepared, bars beyond the maximum available hours identify need for resource leveling strategy. Release criteria – Morale is improved if transitions are already planned. Purpose: The Communications Management Plan is created to define how and when stakeholders will be communicated with. Why It Is Important: Lists how you are expecting to communicate with stakeholders. It defines the following…. Purpose: The Risk Management Plan is created to so you know how to approach certain risks using activities with the Risk knowledge area in correct sequence. Categorization of risks using the Risk Breakdown Structure (RBS) which breaks down the categories of risks not the actual risks. Purpose: The Procurement Management Plan defines the sequence of activities while conducting procurements . Purpose: The Stakeholder Management Plan is created to define how team will relate to stakeholders and the roles of each of stakeholder in the project. Why It Is Important: Helps manage stakeholders expectations, defining how team engages with them and how to deal with issues. *Stakeholder Management Plan usually not shared with all stakeholders. Purpose: The Scope Baseline is made up of…. Baselines include the original plan and all approved changes. Purpose: The Cost Baseline is the approved version of time-phased project budget excluding any management reserves. It is developed as a summation of the approved budgets for the different schedule activities. Why It Is Important: It helps keep track of costs down to the activity level by comparing actual results versus expected. The below chart demonstrates the various components of the project budget and cost baseline. 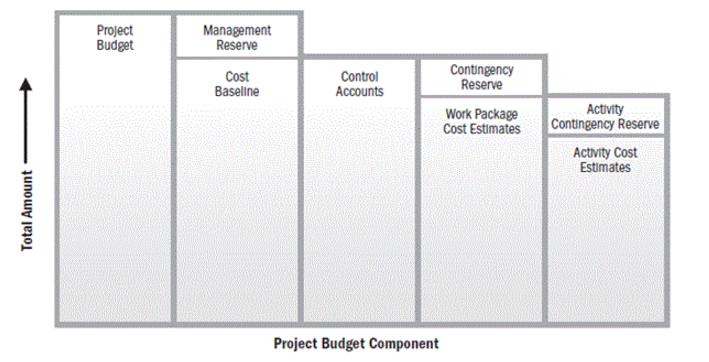 Activity cost estimates and contingency reserves are aggregated into their associated work package costs estimates. The summation of work package cost estimates and the work package contingency reserve makes up the control accounts. The summation of the control accounts make up the cost baseline. Purpose: The Schedule Baseline is the approved version of the project schedule that can only be changed through formal change control procedures. it is used to compare expected versus actual schedule to keep track of timing of project. Why It Is Important: It is used to ensure a project stays on track and helps the project manager identify if project vis ahead or behind schedule.